Neat Iota review | What Hi-Fi? Look, nobody tell the Neat Iota loudspeakers they’re really small, right? If we all keep schtum, they might just keep on turning out a big, weighty and detailed sound, capable of amazing all who hear them. OK, they’re not cheap, but what you’re paying for is not the size of the box, but the size of the sound. Actually, no: you are paying for the size of the box – and the design and technology used to squeeze so much sound out of enclosures so compact. There’s a lot that’s unusual about the Iotas, from the planar ribbon tweeter to the fact they’re designed to be used ‘on their sides’, standing just 13cm tall, 20cm wide and 16.5cm deep. That makes them ideal for use on desktops, shelves or brackets – they have standard mounts for easily available wall-hanging hardware – but optional stands are also available for £120 a pair. Neat says that the ribbon tweeter was chosen as its ‘strengths of superb dynamic contrast and accurate tonal colour are well matched to those of the main drive unit’ and that the two drivers are linked with a simple, three-element crossover using low-loss air core inductors and high-grade polypropylene capacitors. As is usual with Neat products, the crossovers are designed the best way – as the result of extensive listening, designing by ear rather than measurement. The technique has served the company well for a long time: the Neat team has combined its talents in speaker design, recording and musicianship to wring out of very small boxes much more sound than one would expect. The Iotas are rear-ported, so benefit from a bit of reinforcement from a solid wall behind them, and the suggested amplifier power here is 25-100W, while 84dB/W/m sensitivity and 6ohm nominal impedance means they won’t present any problems even with modest amplification. 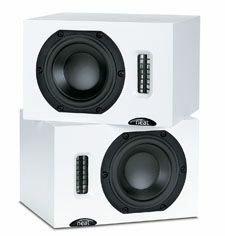 The pair of Iotas supplied for review were in satin white – the speakers are also available in satin black as standard, with flame red, zinc yellow and ultramarine blue as options. And while we suspect most users will put the speakers on shelves or a table-top, there are optional stands, at £120/pr a slimline model designed to complement the miniature speakers. These have three substantial floor-spikes, take about ten minutes to assemble, and even come with a pack of Blu-tack to attach the speakers to the top-plates. Alternatively Neat suggests the speakers should be used on isolating cones if placed on shelves or table-tops, and has also fitted the speakers with two-point horizontal 60mm-spaced M6 mounting points, to which a wall-bracket could be attached. It suggests the B-Tech BT33 as one suitable choice for this – a pair of those will set you back a very sensible £15-£20, and you needn’t worry too much about the ability of your wall to hold the speakers, as they only weigh 3kg apiece. As the Iotas come as a mirror-image pair, you can experiment with using them with the tweeters innermost or outermost. ‘In’ gives really sharp stereo focus, but a rather too-small soundstage; we preferred ‘tweeters out’ for a bigger sound and the improved depth and openness. But however you use the Neats, you’re not going to feel short-changed by the detail, weight and scale on offer: whether with pacey rock or pop, or complex classical works, these speakers sound truly remarkable, and should be auditioned. They're well-suited for use with amplification of modest power, and just keep getting better as the partnering equipment is improved. True there are other speakers able to do as much for the same money, but none of them do so while taking up so little space. We talked to Neat founder and MD Bob Surgeoner (left) about how music has influenced the way the company designs its speakers. As mentioned in the review above, Neat Acoustics Neat Acoustics is unusual among hi-fi companies in being run by musicians, having its own recording studio on-site and doing all its development by ear, not by measurement. Surgeoner explains that he got his first musical exposure at an early age, when ‘Our headmaster would play selections from Bach, Handel, Elgar etc. on a console record player whilst we waited for assembly to start. Having worked as a musician for 25 years up to 1995 mainly in jazz, folk and blues, Surgeoner plays piano, guitar, double bass, accordion and banjo, but always wished he'd learned the harp. So, he says, he's now making ‘slow but steady progress’ learning the Celtic harp he’s bought.